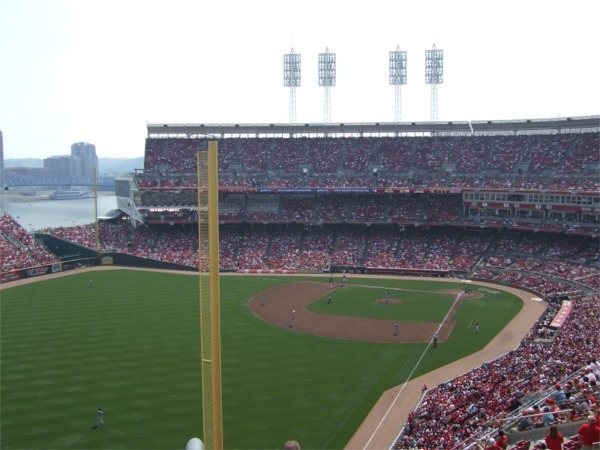 Along the banks of the Ohio River in downtown Cincinnati sits the second ballpark the Reds have called home and the site of the 2015 MLB All-Star Game. 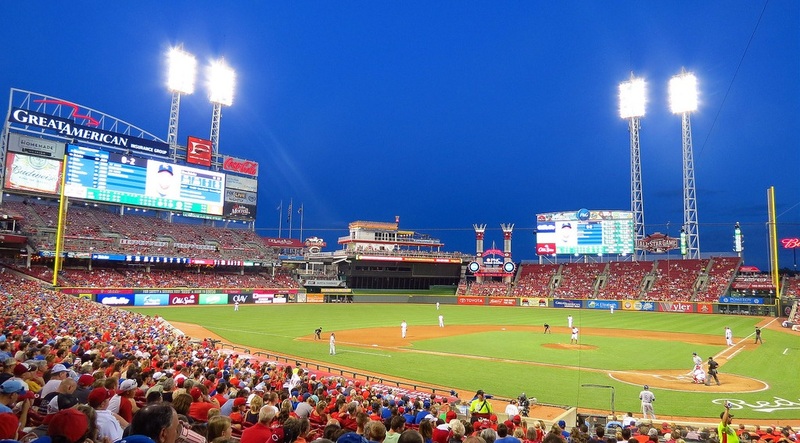 Great American Ball Park is one of the city’s crown jewels as it has revitalized the area along the riverfront and is the home to baseball’s oldest franchise, the Cincinnati Reds. 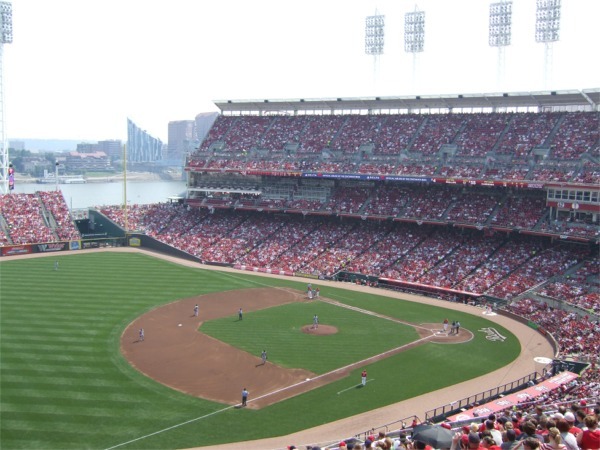 It opened on March 31, 2003 when the Reds battled the Pirates in front of over 42,000 fans. 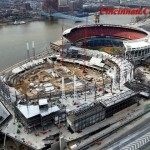 Great American Ball Park replaced Riverfront Stadium that sat directly west of the ballpark. 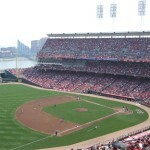 Riverfront Stadium was a multipurpose stadium that opened in 1970 as the home of the Reds and Cincinnati Bengals (NFL). 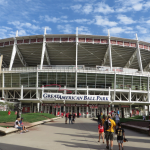 It was a typical cookie-cutter stadium that could be found in just about every other city. 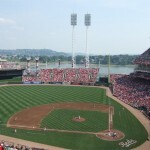 In the 1990s both the Reds and Bengals wanted new separate modern stadiums after sharing Riverfront Stadium for nearly three decades. 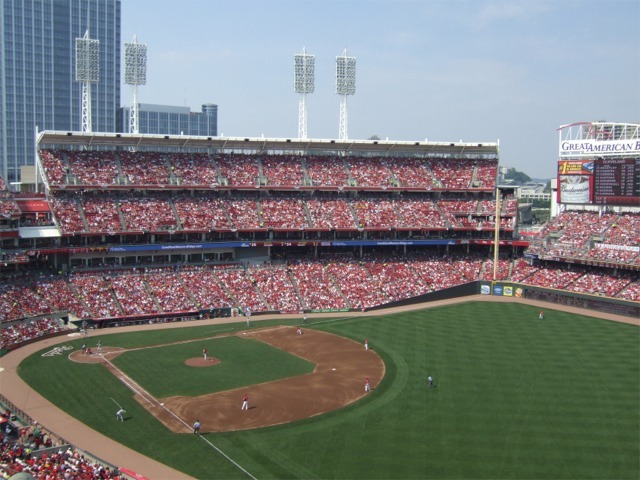 In 1996 Hamilton County voters approved a bond to increase the sales tax to fund stadiums for both teams. 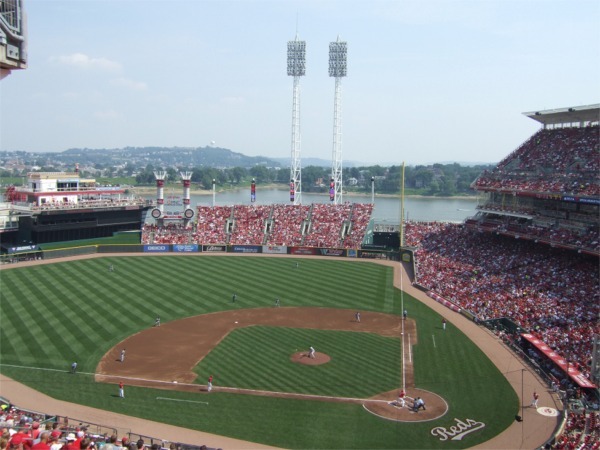 Two locations for a new Reds ballpark were proposed: Broadway Commons and an area between Riverfront Stadium and US Bank Arena, known as the ‘wedge’. 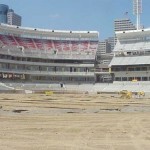 It took over a year for officials to determine where to construct the ballpark. 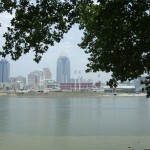 Reds officials were concerned about the cost of land at Broadway Broadway Commons whereas the land along the river was owned by Hamilton County. 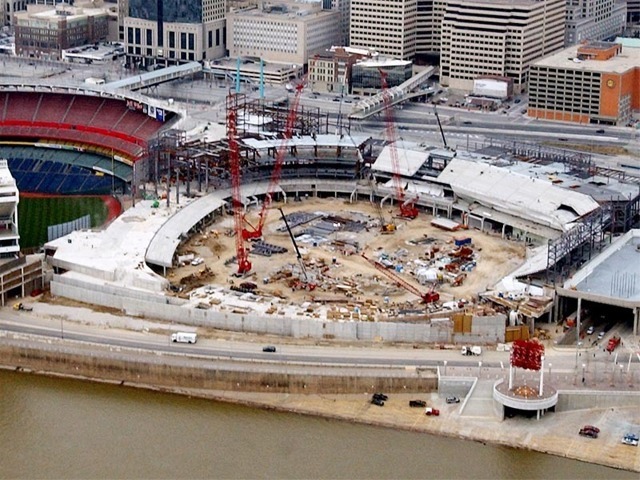 In November 1998, citizens ended the question of where the ballpark would be built, voting to have it constructed along the riverfront. 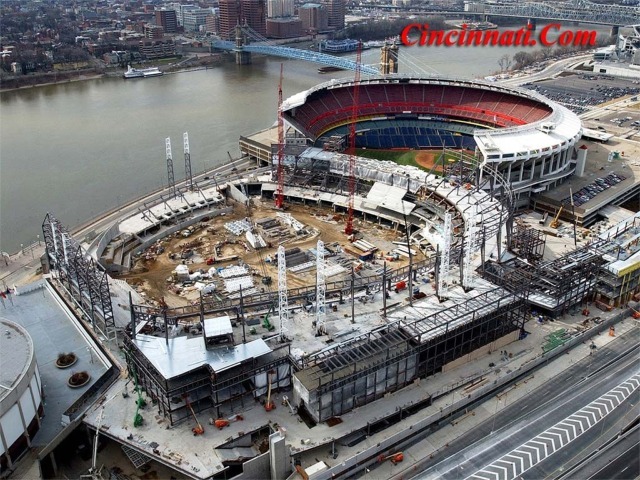 However, this did not end the stadium debate in Cincinnati. 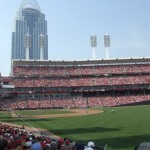 Owner of the Reds, Marge Schott, threatened to move the team to Northern Kentucky if the team did not receive a better lease agreement than the Bengals. 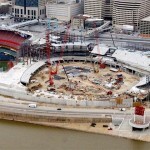 Reds and city officials agreed to a lease and groundbreaking for the ballpark occurred on October 4, 2000. 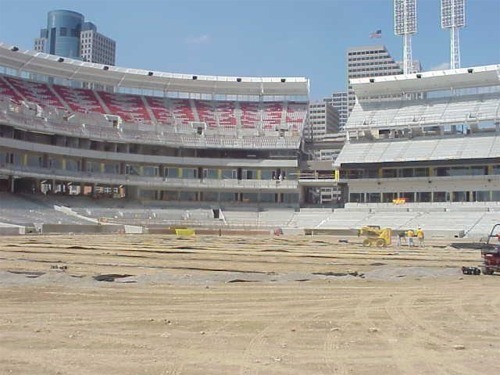 In order for construction to begin, 14,000 seats had to be removed from the outfield of the Reds’ former home, Riverfront Stadium. 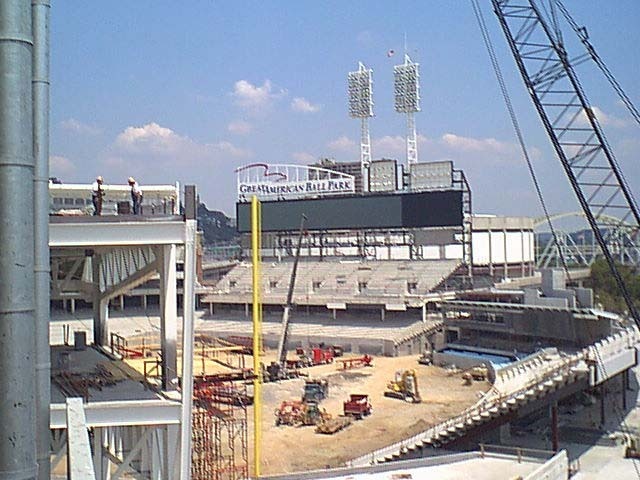 For two years, Reds fans were able to watch the new ballpark rise beyond the outfield of Riverfront Stadium. 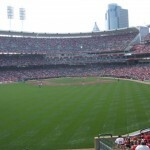 Great American Insurance bought the naming rights to the ballpark for $75 million over 30 years; thus the stadium was named Great American Ball Park. 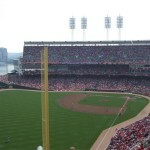 Ken Griffey Jr. gets the first hit at Great American Ball Park, a double. 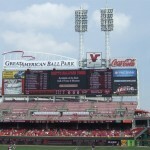 Homer Bailey pitches the first no-hitter at Great American Ball Park on July 3, 2013. 2010 NL MVP Joey Votto. 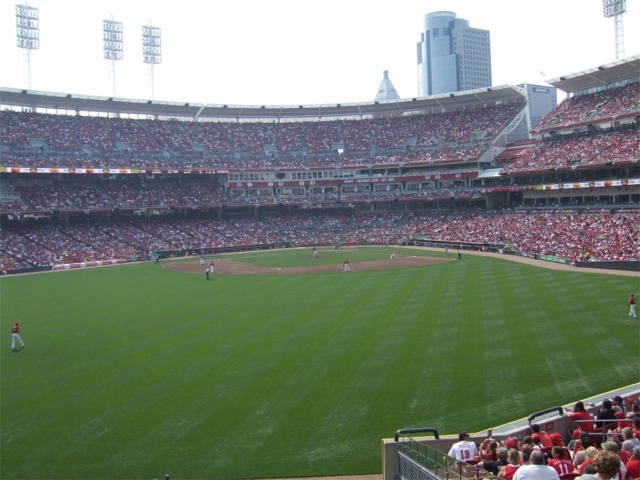 Great American Ball Park is a combination of new and old ballparks and provides an excellent setting for baseball. 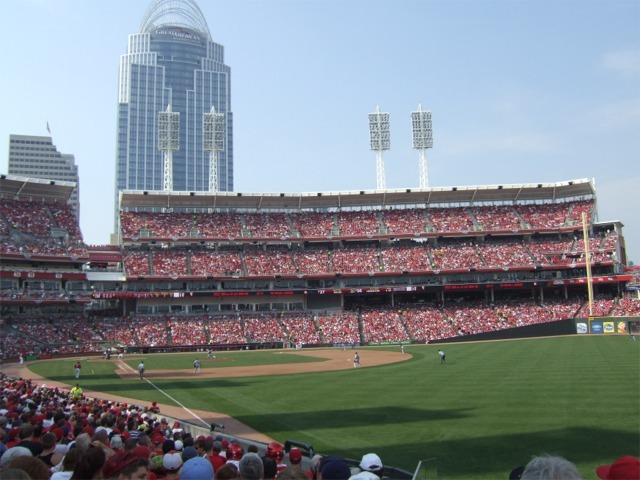 Walking along the outside perimeter of the ballpark down Second Street, fans are greeted by a three story building of brick and cast limestone, with the phrase “Rounding third and heading for home,” the signature sign-off of broadcaster Joe Nuxhall, atop the building. Banners of great moments in Reds’ history also line this area. At the intersection of Second and Main streets is an opening to Crosley Terrace, the homeplate entrance, that most fans pass through when entering the ballpark. The terrace is about an acre of concrete, landscaped with grass and trees. 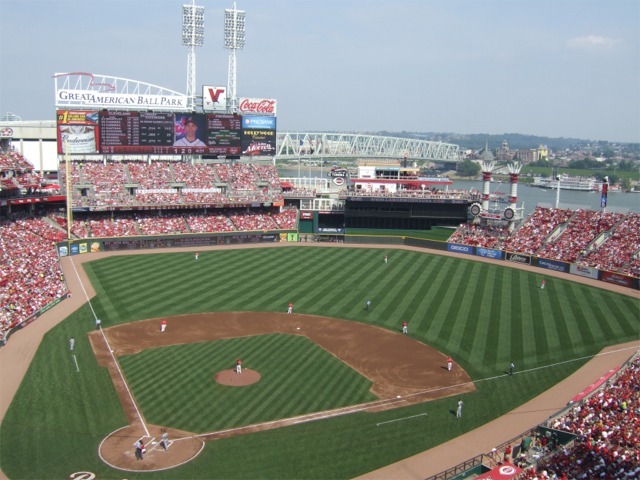 Statues of Crosley Field-era players (Joe Nuxhall, Ernie Lombardi, Ted Kluszewski, Joe Morgan, Johnny Bench and Frank Robinson) dot the landscape, along with a pitcher’s mound built to Major League Baseball dimensions of the day. Grass in the terrace is sloped at the same incline as Crosley Field’s outfield. Special lighting illuminates the statues, stone benches and a 60-foot stone sculpture meant to depict the romance of the game are also located in Crosley Terrace. 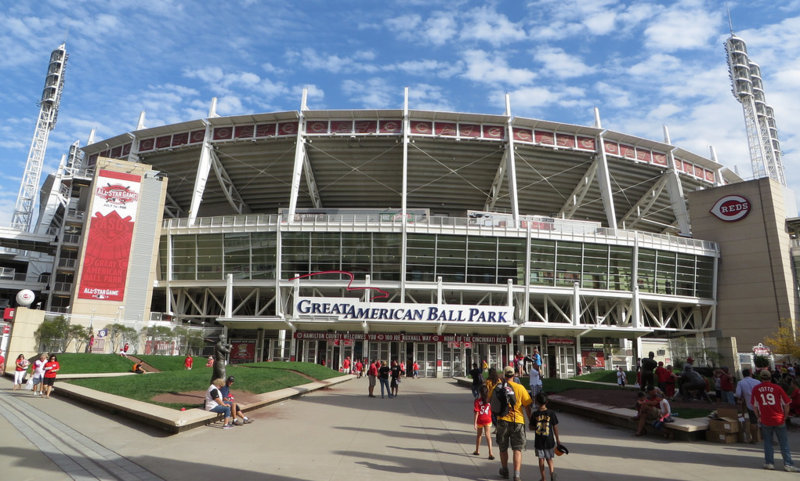 Adjacent and connecting to Great American Ball Park along Main Street is the Reds Hall of Fame Museum and team store. A rose garden, remembering Pete Rose, is located near the museum where his record breaking 4,192 hit was at Riverfront Stadium. Upon entering the ballpark, fans have sweeping views of the ballpark. 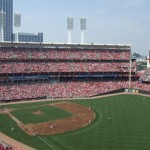 Great American Ballpark has approximately 42,271 red seats in three levels. 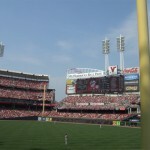 The lower grandstand extends from the left field foul pole to homeplate and around to the right field foul pole. 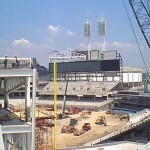 The second deck consists of club seats, luxury suites, and the press box. Stretching from foul pole to foul pole, the upper deck is broken into two sections. The gap is an opening in the seating sections located between homeplate and third base. 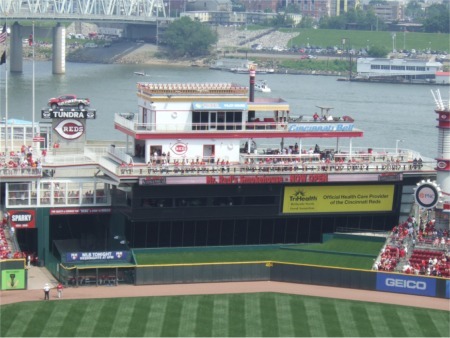 This enables people in downtown Cincinnati to see into the ballpark. 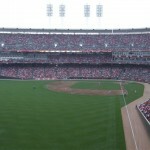 The gap allows the upper deck to be closer to the field than most in baseball. 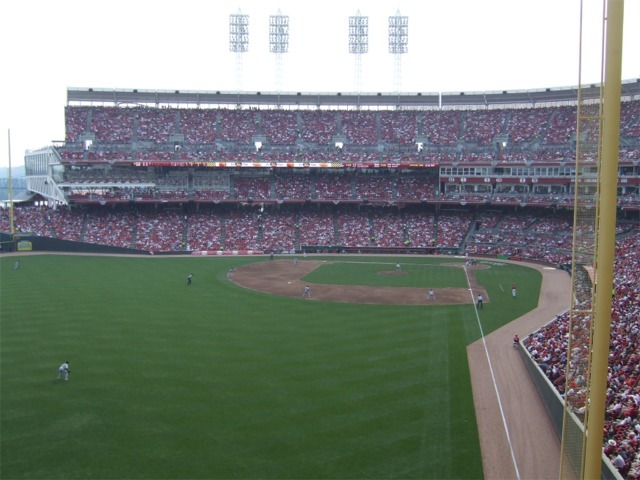 Doubled decked bleachers are located in left field and additional seating is located beyond the right field fence. 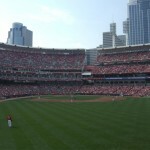 With little foul territory at Great American Ball Park fans receive excellent views of the game. Above the bleachers in left field is the 138 foot wide by 38 foot high LED video/scoreboard. 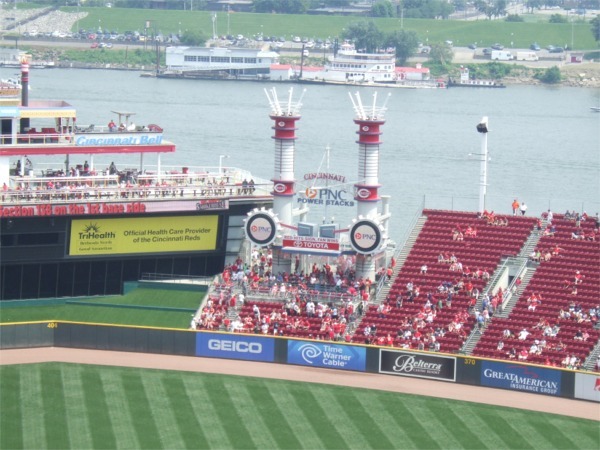 A clock atop the main scoreboard in left field is a replica of the Longines analog clock that was at Crosley Field. 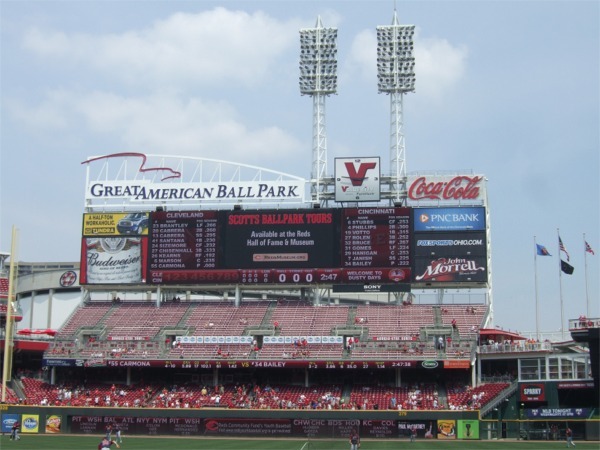 The bullpens are located beyond the outfield, the Reds in left centerfield and the visiting team’s bullpen behind the outfield wall near the right field foul pole. A brewpub, known as the Machine Room Grille is located in the left-field corner gives fans a place to relax and catch the ballgame with their friends. The bar features tons of memorabilia from the Big Red Machine era. 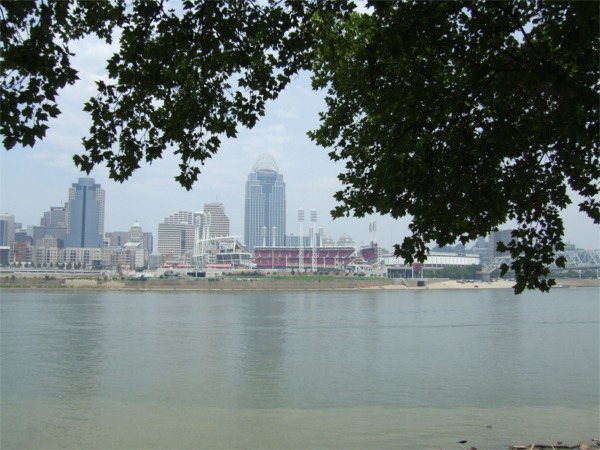 Other club and dining options include the Fox Sports Ohio Championships Club, the Handlebar at Riverfront Club and Diamond Club. 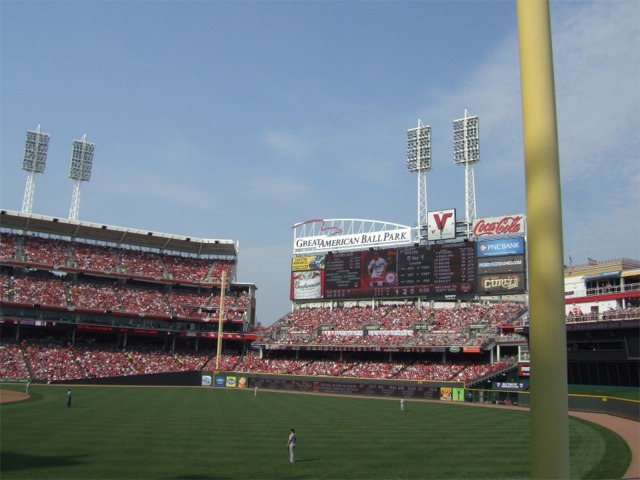 Located between the batters eye and the stands in right field is a 64 feet high and 36 feet wide homerun feature. It consists of two large smokestacks, a paddle wheel and a large misting system makes noise, shoots fireworks, creates mist and is a general source of entertainment. 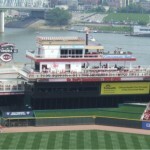 After the 2006 season, the Reds constructed a two story Riverboat Deck on top of the existing batter’s eye and that is used as a party area. The 7,500-foot square foot rooftop deck holds about 150 fans. The newest addition to the ballpark is the right field videoboard. 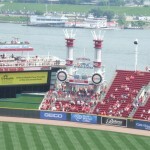 Add prior to the 2015 All-Star Game, the 90-feet wide by 31-feet high LED video board sits above the Sun/Moon Deck seats. 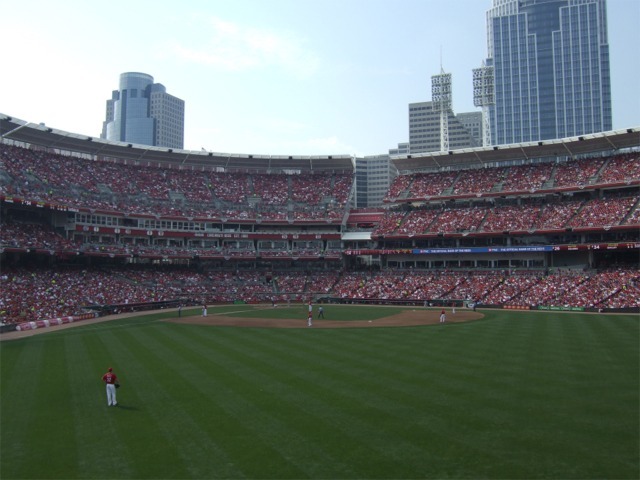 In 2010, postseason baseball returned to Cincinnati as the Reds won the National League Central Division for the first time since 1995. 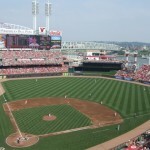 The Reds hope to build on their recent success and return to their former glory from the 1970s with stars such as Joey Votto and Jay Bruce.